A torus consists of a central axis with a vortex at both ends and a surrounding coherent field. Energy flows in one vortex, through the central axis, out the other vortex, and then wraps around itself to return to the first incoming vortex. The simplest description of its overall form is that of a donut, though it takes many different shapes, depending upon the medium in which it exists. For example, a smoke ring in air or a bubble ring in water are both very donut shaped. And yet an apple or an orange, which are both torus forms, are more overtly spherical. Plants and trees all display the same energy flow process, yet exhibit a wide variety of shapes and sizes. 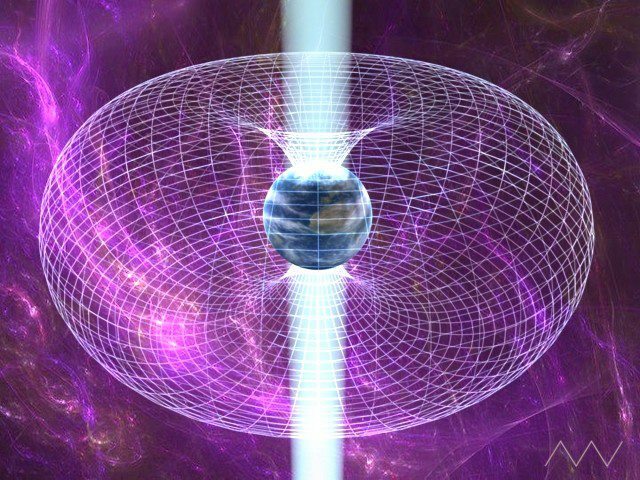 Hurricanes, tornadoes, magnetic fields around planets and stars, and whole galaxies themselves are all toroidal energy systems. 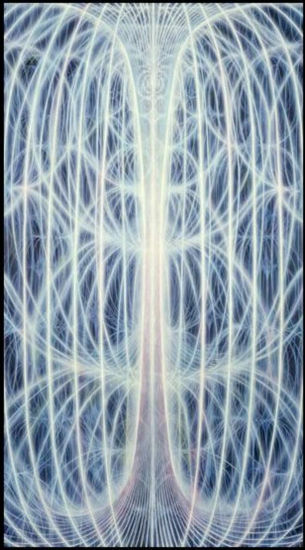 Extending this observation of the consistent presence of this flow form into the quantum realm, we can postulate that atomic structures and systems are also made of the same dynamic form. And here’s a video by NASA showing toroidal field dynamics around spinning pulsar stars inside our galaxy. Here’s an animation of the distinct toroidal form of a red blood cell. Continuing our exploration of the torus as a form and flow process, one of the key characteristics of it is that at its very center, the entire system comes to a point of ultimate balance and stillness — in other words, perfect centeredness. Like the center point of the vector equilibrium, this is the center point “singularity” of the torus. And since we’re really talking about a unified model of cosmometry (even though we’re describing the model’s constituent parts “separately”), this center point is one and the same in both the VE and the torus. In the VE, it’s the center of the system in its state of unmanifest perfect equilibrium. In the torus it’s the center of the system in its state of manifest flow process. As in the case of a black whole singularity at the center of galaxies, this center point within all systems connects the system continuously with the underlying Unified Field (energy and information return to the zero-point source state of infinite density via a singularity). In this way, everything is unified and holographically present as the Unified Field informs every manifest entity of the entirety of the cosmos in every moment, and every entity informs the entire cosmos of its localized presence via the Unified Field. This kind of reciprocal exchange is a primary feature of toroidal systems, wherein the individual is informed and influenced by its surrounding environment, and the surrounding environment is informed and influenced by the individual, in a continuous balanced rhythmic interchange. Another fundamental aspect of this ubiquitous flow process is what’s called the Double Torus dynamic. This is, simply put, two torus forms “stacked” together and rotating in opposite directions. In this way, energy flows either inward or outward at both poles of a system, rather than in one pole and out the other as in a single torus system. 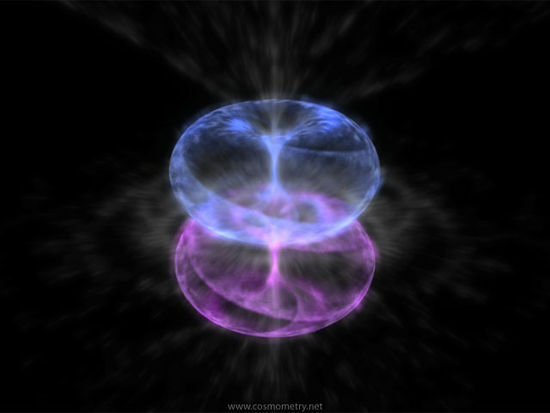 This double torus dynamic appears to be quite common in the cosmos as well, appearing in the energy flows of trees, in the weather patterns of Earth and other planets, in solar dynamics, and even in galaxies. The torus as a flow process exhibits a set of characteristis that evolution biologist, Elisabet Sahtouris, has identified as features and principles of healthy living systems. Through her study of living systems (ecosystems, for example), she has observed that when these features are present, the system is balanced and whole. When these features become compromised or absent, the system goes out of balance and becomes dysfunctional and corrupted to the point that it will either collapse completely, transform into a new balanced state, or restore its balance again by restoring the appropriate presence and functioning of these features. It is in understanding the unique roles and coordinated wholeness of these features and principles that we can evaluate and restore the dynamic balanced flow within all of our human-contrived systems such as economics, education, health, governance, communications, etc. Each of these, when functioning in a healthy manner, will exhibit characteristics of a torus flow process, and will naturally then interconnect and mutually empower each other in a larger toroidal system that is the synergetic wholeness of all of them combined. Unification and harmonization… this is the threshold of evolution we find ourselves at now at a new level of global dynamics and complexity. We have built systems of technologies, economies, governance, education, etc, that do not properly account for the features of healthy living systems. As such, they are reaching the end of their viability and are either going to collapse or become balanced and whole at a higher level or organization and coherence. The choice we have now — perhaps the only viable option — is to align these systems with what we now understand is the way the cosmos creates healthy and sustainable systems… cosmomimicry, as David McConville, president of the Buckminster Fuller Institute, coined it. Fundamentally, what we are operating from is the principle and tangible effects of resonance. The Unified Field has an infinite potential of energy and creativity. It expresses this as physical and metaphysical phenomena — energy and consciousness — in a continuous and ever evolving flow. The most balanced, coherent, self-generating and self-sustaining form of dynamic flow is the torus. By creating technologies (for example, what are called free-energy devices) and systems that mimic this flow we engender a synchronizing resonance with the cosmic patterning of life and tap into a resource of energy and creativity that is abundant beyond measure. We can do this personally by learning how to become centered in and embody the torus flow dynamic of our own energy beings (which stabilizes and integrates our physical, mental, emotional and spiritual “bodies”, see The Human Experience article). We can do this collectively by understanding that this same dynamic extends into the balanced flow of information and resources throughout local, regional and continental societies. And we can do this technologically by resonating with the fundamental structure of the Unified Field and setting up a harmonic flow form that taps its infinite energy potential in a clean, safe and balanced manner. This is a glimpse into the powerful effect at all levels of our human, earthly and cosmic experience that applying the dynamic flow process of the torus and the features and principles of healthy living systems can bring into our world.